You’ve got to love a book whose last line of text is that, don’t you? I’ve been a Black Sabbath fan since 1981 (30 years, man). Anyway, over the years, I’ve read a ton of interviews, heard a lot of video, listened to many an audio clip. I’ve learned a thing or two (Note sarcasm) about the band and Tony Iommi over the years. You don’t get to be the guy who runs black-sabbath.com and not know something about the subject. I point this out because it’s with that encyclopedia of knowledge that I sat down about a month ago to read “IRON MAN: My Journey through Heaven & Hell with Black Sabbath”. It’s Tony Iommi’s autobiography. It’s out this week in the United States, and I wanted to say a few things about it. But what we did get was fairly comprehensive. He covers all kinds of subjects, and while some of them are shorter than I would have liked (the “Lita Ford” chapter is just two pages), he does cover just about every part of his life you’d probably want to know about. Even for someone like me who knows most of the stories, there were still a couple of Black Sabbath bits I didn’t know about, so that was cool. But the bits about his personal life were very cool. If you know your Sabbath trivia, you have heard the story about him losing the tips of his fingers rather a lot. Might have heard of a few band names he was in before that (Rockin’ Chevrolets, The Move, etc), but before his band days, not so much. That was the most interesting bits for me. It wasn’t just his childhood, there were several personal bits scattered through the Sabbath time, too. The stories about his daughter, though were of particular interest to me. Also to my wife. My wife read a few bits about Tony and his daughter, and really enjoyed the parental and personal side of Tony here. We all think of Tony as the man with the guitar in Black Sabbath. Few of us probably ever think of him as a father who loves his daughter. That comes through quite well in those parts of the book. I, of course was most interested to see if he’d talk about a lot of the “dark corners” of the band’s history. People and names like David Coverdale, Ron Keel, Dave Donato, Jeff Fenholt, Jo Burt, Dave Walker, & Craig Gruber. They’re all touched on in here, so the obscure parts that most people don’t know about are in here. I was overjoyed they weren’t brushed under the carpet so to speak. Heck, Tony’s side project with Bev Bevan named “Belch” even gets a mention. Poor ol’ Bill Ward, though. Some of the stories in here make you wonder why Bill put up with it. The AA meetings, setting him on fire There was a chapter in here called “This is your captain freaking…” where it talks about how Bill ended up under a tour bus and having the entire contents of the toilet system dumped on him. Bill’s reaction to that made me laugh out loud reading the book! There’s 16 pages of photographs, the majority of which I’d never seen before. A couple I had, but most I had not. Ranging from when he appeared to be no more than 4-5 years old with his mum, through school, 60’s bands and TV adverts (!) through Sabbath, Heaven & Hell, and other related items, there’s some good pics here. 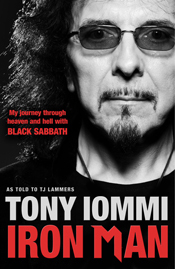 Overall, it’s a comprehensive look at all the major bits surrounding Tony’s life, Black Sabbath, and all that. As I said, I wished it was significantly longer, but that’s not really the fault of Tony or the book – that’s my own expectations and wishes. I would have been QUITE happy with a few thousand page book, and given that would never happen, I had fun reading this. Laughed out loud at a few bits, had a few emotional tugs when he talked about his daughter, so yeah. I enjoyed it. If you’re reading THIS review, then you should get the book. The links below will take you to the ordering pages for it on Amazon.com & Amazon UK. That’s not the end of it though. Tony’s been on a book signing tour, having recently done a handful of dates around England. Yesterday (Nov 1st), he did the first US book signing, and Damian from this site was dispatched to the event to cover it. Check out this video below with Damian’s report. Additionally, you will want to check out this replay of a livestream video Tony did where he answered questions online. It’s 45 minutes long, and Tony talks about any number of subjects. You won’t want to miss that. Thanks for reading, and make sure to buy the book! The name ‘Tony Iommi’ sends shivers down the spines of guitarists around the world. As lead guitarist and songwriter of Black Sabbath, Tony Iommi is considered to be one of the most influential musicians of the past four decades and the inventor of heavy metal. From working class, Midlands roots, his unique playing style – a result of a disfiguring hand injury he suffered working in a sheet metal factory — created a dark and gothic sound unlike anything that had been heard before and which captured the mood of its time. Sabbath went on to become a superband, playing to massive audiences around the world and selling millions of records, and Iommi led the life of a rockstar to the fullest – with the scars from all the drug-fuelled nights of excess and wildness to show for it. Iron Man is the exclusive account of the life and adventures of one of rock’s greatest heroes. Iron Man chronicles the story of both pioneering guitarist Tony Iommi and legendary band Black Sabbath, dubbed “The Beatles of heavy metal” by Rolling Stone. 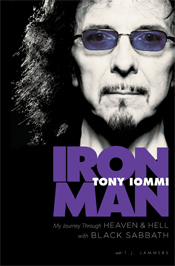 Iron Man reveals the man behind the icon yet still captures Iommi’s humor, intelligence, and warmth. He speaks honestly and unflinchingly about his rough-and-tumble childhood, the accident that almost ended his career, his failed marriages, personal tragedies, battles with addiction, band mates, famous friends, newfound daughter, and the ups and downs of his life as an artist. All time favorite! Tony doesn’t play guitar ! He is the guitar!